This fun and lively snapshot of Arlington, Washington wedding photography clearly shows that the groom knows that he is a pretty lucky guy. The bridesmaids were also very ready to join in the celebration of the newlyweds. On a beautiful sun-soaked day in Snohomish farm country, we walked around the beautiful country grounds of A Country Location, taking wedding day portraits under a large oak tree and around a charming pond. The wedding party honestly had this much fun all day. You could walk for hours here and never get bored – the country vistas were jaw-dropping and offered color and contrast to this lovely wedding and wedding party. A Country Location is known for providing a peaceful country paradise in addition to a wonderful nature walk, a barn, a windmill, a fountain, incredible gardens, and a fantasy location for weddings and wedding photography. Outdoor wedding photography can be pretty unforgettable, and this location offered pampering and natural beauty, a grand experience and a gorgeous background for the couple’s wedding day. The green and pink next to a blue sky created bright, happy photos such as this one throughout the day. Finally, the fun-filled reception included an amazing candy bar for the kids, a variety of of lawn games such as golf putting, lawn darts, a bean bag toss and croquet, and an insanely delicious dinner of fried chicken and waffles from Blue Ribbon catering. 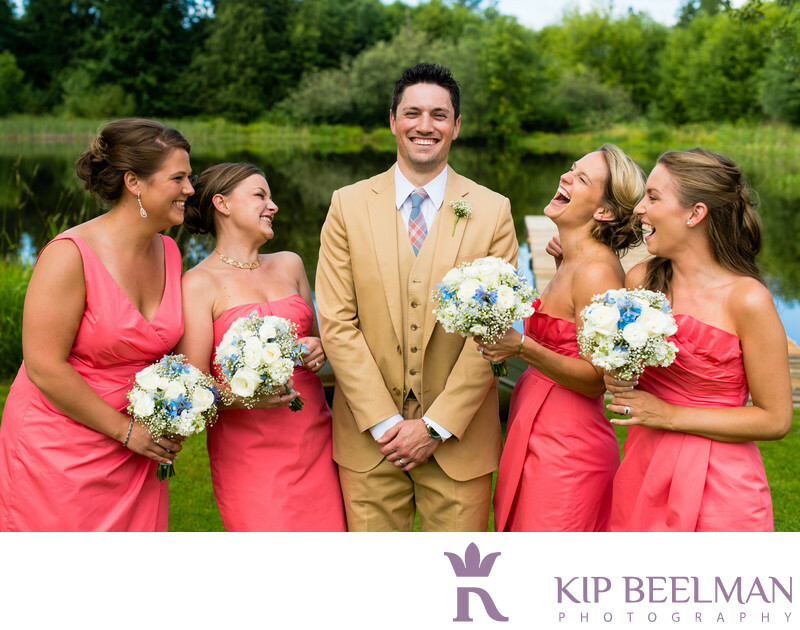 Laughter and love were the order of the day and the highlight of these Country Location wedding photos. Location: 333 156th St NE, Arlington, WA 98223. Keywords: A Country Location (6), Arlington (6), Farm Wedding (21), Outdoor Wedding (72).